A true diner classic, Chocolate Cream Pie is a head-turning treat, and just the thing for lovers of both chocolate and pie. The crust is blind-baked, then filled with a cooked, cooled chocolate filling. Topped with lightly sweetened whipped cream, it's the perfect combination of crispy crust, dense chocolate-y filling, and ethereal cream garnish. 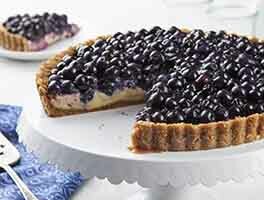 This is a tall pie with a generous amount of filling. You can customize the chocolate flavor to your taste, by using bittersweet, semisweet, milk chocolate, or any combination of these that you like. Our guarantee: This pie will slice cleanly, have a flaky crust, dense chocolate filling, and lightly sweetened whipped cream on top. To make the crust: In a medium bowl, whisk together the flour and salt. Work in the shortening until it's in lumps the size of small peas. Dice the butter into 1/2" pieces, and work it into the mixture until you have flakes of butter the size of your fingernail. Add the water 2 tablespoons at a time, mixing with a fork as you sprinkle the water into the dough. When the dough is moist enough to hold together when you squeeze it, with no floury patches or bits of dry pastry in the bottom of the bowl, transfer it to a lightly floured work surface. Fold it over on itself three or four times to bring it together completely, then pat it into a disk 3/4" thick, rolling the disk to smooth its edges. Wrap the pastry in plastic and refrigerate it for 30 minutes before rolling. To pre-bake (blind bake) the crust: Preheat the oven to 400°F. Lightly grease a 9" pie pan that's at least 2" deep. Roll the pastry into a 13" circle. Transfer it to the prepared pan, and trim the edges so they overlap the edge by an inch all the way around. Tuck the edges up and under, and flute or crimp them. Put the lined pie pan in the refrigerator to chill for 10 minutes. 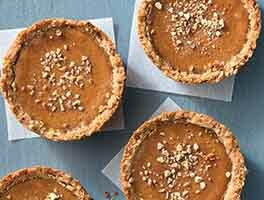 Line the crust with foil or parchment paper, and fill it with pie weights or dried beans. Bake the crust for 20 minutes. Remove it from the oven, and gently remove foil or parchment with the weights or beans. Return the crust to the oven for 10 to 20 more minutes, until it's golden brown all over. If the edges of the crust start becoming too brown, cover them with a pie shield, or strips of aluminum foil. Remove the crust from the oven and cool completely. To make the filling: Place the chopped chocolate, butter, and vanilla extract in a 2-quart mixing bowl; set aside. In a medium saucepan off the heat, whisk together the sugar, cornstarch, cocoa, espresso powder, and salt. Whisk in 1/4 cup of cold heavy cream until the mixture is smooth, with no lumps. Repeat with another 1/4 cup of the cream. Whisk in the egg yolks. Place the saucepan over medium heat, and gradually whisk in the remaining cream and milk. Bring to a boil, whisking constantly as the mixture thickens; boil for 1 minute. Remove the pan from the heat and pour the mixture over the reserved chocolate and butter. Whisk until the chocolate is melted and the mixture is smooth. Pass the filling through a strainer into a bowl to remove any lumps. You can use the back of a ladle, a flexible spatula, or a wooden spoon to stir it through the strainer. Scrape the underside of the strainer once in a while with a clean spatula to help the process along. Place plastic wrap or buttered parchment paper on the surface to prevent a skin from forming, and chill thoroughly. A shallow metal bowl with more surface area will chill the filling most quickly. To make the topping: Place the heavy cream in a chilled mixing bowl. Whip until the whisk or beaters begin to leave tracks in the bowl. Add the sugar and vanilla and whip until the cream holds a medium peak. To assemble: Spoon the cooled filling into the cooled, baked pie crust. Level the top with the back of a spoon or an offset spatula. Spoon or pipe the whipped cream on top. Note: If you're not planning on serving the entire pie at once, top individual slices with a dollop of whipped cream just before serving. Chill the pie until ready to serve. 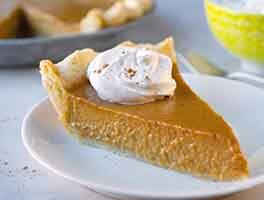 For best slicing, refrigerate the pie overnight before serving. 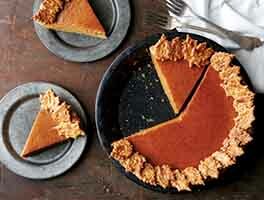 To make a Chocolate Toasted Almond Cream pie, make and blind bake Toasted Almond Pie Crust. Add 1/3 cup (2 3/4 ounces) creamy almond butter and 1/8 teaspoon almond extract to the chocolate and butter in the bowl when you make the filling. For the topping, add 1/8 teaspoon almond extract along with the vanilla, and garnish the pie with 1/2 cup toasted sliced almonds. Delicious!!! Followed the steps. Shared the pie at a party and everyone, EVERYONE loved it! A few asked for the recipe! Definitely, a keeper! This is a win. Great recipe. To those claiming it is too time consuming... not really. And while the recipe states to strain it, it is not REQUIRED if you do not wish to. For me.... I strained it because I want to be SURE it was smooth throughout. It was absolutely the creamiest and smoothest chocolate pie I have ever made. The crust is worth the extra steps as it works PERFECTLY with this recipe. However... I did make a couple changes based on taste and ingredients on-hand. ( 1 ) Used light cream in the filling as I only had enough for making whipped cream for the topping. This did NOT alter the outcome. ( 2 ) I used bittersweet chocolate chips instead of semi-sweet chocolate. I do not like overly sweet pies and overly sweet chocolate in general and this toned down the sweetness immensely. I suggest this is you have made this pie and found it to be too sweet for you. Thanks for a great recipe, KAF! I completely agree with Donna from Chicago . Far too time consuming . Just use your own pie crust recipe as she said . Straining the filling ? I'm not aware of other recipes that require that . One of the most needlessly time consuming recipes I've done. 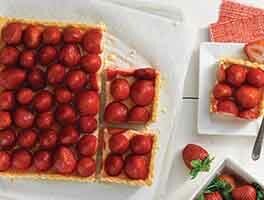 Just use your regular pie crust recipe or a prepared one that you bake and pour the filling into it and chill. I made this pie using puff pastry for the crust instead of pie crust - way better! To keep the crust from rising while baking, top it with parchment, then a tin pie pan, then pie weights in the tin pan. It keep the crust from puffing, but maintains its flakiness. After baking and cooking the crust, I brushed the inside of the crust with melted chocolate and chilled the "painted" crust - this keeps it flaky after filling. I also used bittersweet chocolate instead of semi-sweet for the filling - the pie is still rich, and sweet enough. Question: there is vanilla referenced in the steps when preparing the filling, but I only see vanilla in the topping - ??? This is a really good pie with a smooth texture and rich chocolate flavor. I used a chocolate graham cracker crust and since I didn't have heavy cream I used 3 cups of whole milk and added an extra egg yolk. I thinned the beaten yolks with milk and poured them through a strainer so I wouldn't have to strain the finished mixture, as recommended by another reviewer. This worked great. I was concerned about it setting up given the problems others have reported but this set beautifully. I'll make it again. Pie was amazing the Chocolate was very rich and the cream really topped it off for me! i definitely plan to make this wonderful pie again. The perfect pie! I actually made this in a pre-made Oreo pie crust and used semi sweet chocolate chips because I was looking for a 'pantry clean out' recipe before I went on vacation - WOWWY!!! This pie is FANTASTIC! I also subbed 1/2 an espresso shot from my nespresso machine instead of the espresso powder because I didn't have that on hand. People went wild over this pie and it is definitely a repeat just as I made it. I had never made whipped cream before, but the directions made it fail-proof. 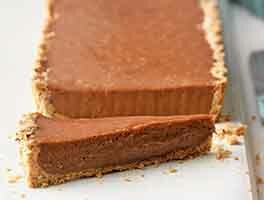 If you're searching for the perfect chocolate cream pie recipe - look no further - this is a CROWD PLEASER! I found this recipe when looking for something to make for a birthday, and I didn't want to do yet another cake. (There were five birthdays that month.) I was told that "anything would do" and since I hadn't had a really good chocolate cream pie in years, I decided to try this one. It was spectacular. I used a combination of semi-sweet and bittersweet chocolate, and used a third more of the ingredients as my pie pans are deep dish, and it turned out amazing. I thought it would be difficult, but the only difficult part was not taking the extra home myself instead of doing my usual thing of giving it to the birthday recipient! Even with a minor mistake of forgetting to strain it, which was easily fixed by... well, straining it, it was smooth, delicious, cut beautifully, held up fantastically. And to top it all off, I got three more requests for it between Thanksgiving and Christmas, with another couple of requests since then! And, I'm planning on making it for myself for my own birthday as well, so I can have most of it this time.